This book is designed to provide a general overview of our current understanding of this extraordinary terrain and to guide the interested visitor to the best and most accessible field sites. Michigan’s Pictured Rocks National Lakeshore was established in 1966 to preserve one of the most exquisite freshwater coastal landscapes in North America. 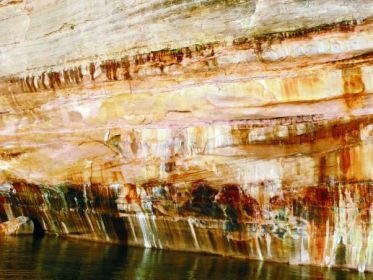 Located between Munising and Grand Marais on Lake Superior, the rugged coastline is anchored by the Pictured Rocks cliffs—soaring sandstone fortresses awash with natural pink, green, and brown pigments. 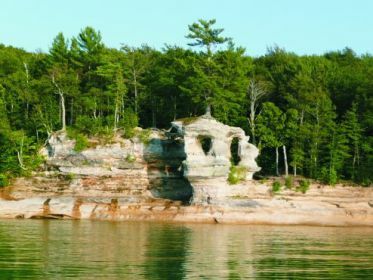 While the Pictured Rocks’ geologic history is generally well understood by scientists, much of this information is scattered among different sources and not easily accessible to general readers. In Geology and Landscape of Michigan’s Pictured Rocks National Lakeshore and Vicinity, William L. Blewett synthesizes published and unpublished information on the park’s geologic history and combines it with vivid color photographs, detailed maps, and diagrams of the area. Blewett examines the history and geology of the very ancient Precambrian, Cambrian, and Ordovician components of the Pictured Rocks dating back hundreds of millions of years, as well as the much younger unconsolidated Pleistocene (ice age) and Holocene (warm period since the ice age, including the modern landscape) sediments mantling the bedrock, most of which are no older than 12,000 years. He also details the history of the Lake Superior basin, tracing the events that shaped the modern shoreline from ancient times. 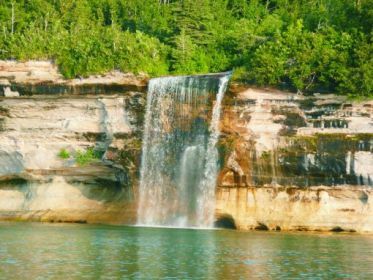 For visitors to Pictured Rocks National Lakeshore, Blewett has provided a detailed mileage-referenced road log to guide readers to the best and most accessible field sites, and, for the more adventurous, includes a day hike keyed to the geology. A comprehensive bibliography and index are also included at the end of the book for further research. While it assumes an understanding of basic geologic principles, the volume is very readable and suitable for students, interested park visitors, and geologists, physical geographers, and those working in closely related fields such as archaeology, biology, ecology, and environmental science. William L. Blewett is professor and chair of the Geography-Earth Science Department at Shippensburg University of Pennsylvania, where he teaches physical geology, geomorphology, and the geology of national parks. 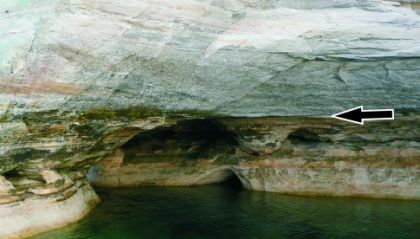 Prior to doctoral study, he was a researcher for National Geographic magazine in Washington, D.C.
To the student of geology and landforms, the Pictured Rocks region provides an excellent natural laboratory for exploring the materials, processes, and events involved in shaping this most sublime of midwestern landscapes. This book is designed to provide a general overview of our current understanding of this extraordinary terrain and to guide the interested visitor to the best and most accessible field sites." After reading it you'll understand the entire coastline geologically and historically. You'll see things you've never noticed before and become more than a tourist as the professor guides you through the formations, dates them, explains them, and synthesizes materials on the area not brought together anywhere else before now. . . . For anyone interested in the natural world as its always been, in Michigan history, in an ecological understanding of our state, or simply in hiking while learning, you cant do better than this book. 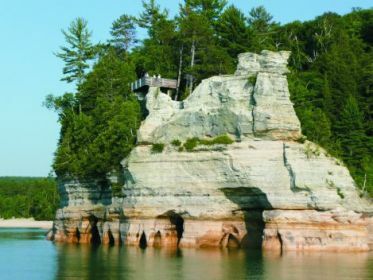 I guarantee, you've never seen the Pictured Rocks National Lakeshore quite like this before.